Canada is synonymous with winter. Canadian teams dominate in winter sports and our landscapes would feel incomplete without a fresh blanket of snow. From coast to coast, this winter has seen exceptionally warm temperatures. A calm climate is great for spending time outdoors, but it also means ice formation! Don’t spend your time slipping and sliding around when professional care can keep you on your feet. Let our expert care put our knowledge and training to use, caring for the treacherous areas of your space. It is easy to become wrapped up in heavy snowfalls, but something more sinister is lurking just below the surface. Everyone knows that temperatures fluctuate throughout the day. Warm, sunny afternoons will melt snow over the course of the day, only to have it freeze again overnight. This process leaves driveways, walkways and yards slick and difficult to manage. Ice poses a safety hazard not only to property owners, but to guests and customers as well. Ice is such a problem that there are even by-laws dictating control of slippery conditions. Save yourself the stress, citations and slips that come along with winter weather, by calling in a Gorilla! There are plenty of reasons that property owners avoid snow removal and salting. A clear property involves a lot of manual labour, cold temperatures and without the proper technique – health hazards. Choosing a professional service means 24 hour emergency call outs for both snow clearing and salting. 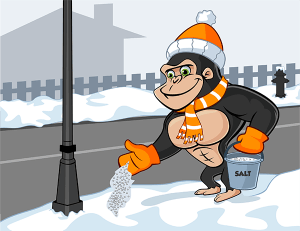 While it seems simple enough to throw down a handful of rock salt, but identifying and addressing problem areas takes a trained eye. Our Gorillas are trained to treat areas around foundations or dips and grooves in grass or cement that collect water and create problems.